The national flag of Moldova. 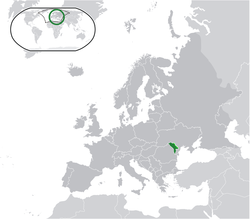 Moldova is a small country in eastern Europe bordering Romania and Ukraine. The capital city is Chişinău. Other large cities are Tiraspol (located in the breakaway region of Transnistria) and Bălţi. Moldova is not part of the European Union and uses the Moldovan leu as its currency. Until 1991 Moldova was part of the USSR. The area east of the Dniester river, known as Transnistria, contains a majority of ethnic Ukrainians and Russians who did not wish to be part of Moldova. In 1992 military conflict occurred between Transistria and the Moldovan government and Transnistria declared itself independent although most countries in the world still recognise it as being part of Moldova. Transnistria's capital is Tiraspol. Since independent, the Communist Party has been the most popular party in Moldova until 2009 when a coalition took control. Moldova is the poorest country in Europe. The average income in the country is about $1,900 per year, far lower than central and western Europe and lower than other parts of eastern Europe. Moldova is located very close to the Black Sea but it does not touch the sea so it is one of Europe's landlocked countries. The country is hilly but contains no mountains - the largest hill is Bălănești Hill at 430 metres. Because Moldova is close to the Black Sea it has warm and sunny summers but winters can be cold with average temperatures of −4 °C in mid-winter. The country has many rivers including Dniester (which separates Moldova from Transnistria) and Prut. Central Europe's largest river, the Danube, enters Moldovan territory for only half a kilometre. Moldova has a population of about 3.5 million. The official language of Moldova is Moldovan which is recognized as a dialect of Romanian. A large number of people, especially in the Transnistria region, speak Russian. The vast majority of Moldovans are Orthodox Christians. Moldova has many beautiful churches and monasteries. Because of poverty many Moldovans, as many as 25% of the population, work in other countries in Europe and send money home to their families. Tourism is increasing in Moldova especially since 2007 when new laws meant that EU citizens no longer need visas to visit the country. Wine-making holidays, especially near the capital are the most popular activity for tourists in Moldova. Monasteries like Căpriana monastery are also popular with Moldovan and foreign tourists. Moldova has one UNESCO World Heritage Site: Rudi Geodetic Point.